Background: Der StÃ¼rmer was convinced that there was a massive conspiracy of which every Jew in the world was a part. This article asserts that normally Jews prefer to stay in the background, letting gentiles fight and die on their behalf, but now the war situation had become so critical that Moscow Jews were now appealing to Jews throughout the world to openly fight Nazism. 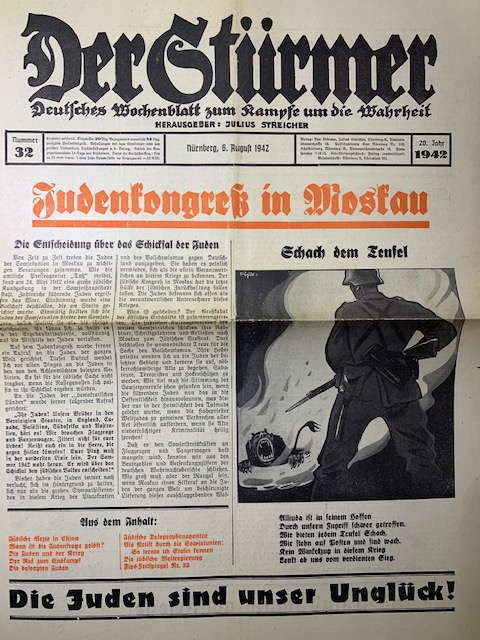 Hanns EisenbeiÃŸ, the author of this article, was an employee of the Weltdienst, a major Nazi anti-Semitic organization. He was also a Nazi Party speaker. For more information on the Stürmer and its editor, see my book on Julius Streicher. The source: Dr. Hanns EisenbeiÃŸ, “JudenkongreÃŸ in Moskau,” Der Stürmer, #32/1942 (6 August), pp. 1-2. The Jews in the Soviet Union meet from time to time for important discussions. The official press agency Tass reports that there was a large Jewish meeting in the Soviet capital. They agreed unanimously on a message to Stalin. The Jews of the Soviet union unanimously lined up behind the Soviet tsar, whose policies they agreed were their policies. He could rely completely on the help of the Jews, the introduction said. The Jewish congress also issued a call to the Jews of the whole world. It was directed above all to Jews in territories occupied by the Axis powers. The Jewish cause could not allow its racial comrades to submit passively to their fate. Before now the Jews always tried to stay in the background, only as supporters of this war of the plutocrats and Bolshevists against Germany. They have carefully avoided taking any responsibility for the war. The Moscow Jewish congress let the last veil fall. The Jews openly admit their responsibility for the war. What has happened? The great Jewish council of the eastern half of the world collapsed. The Jewish communities of the broad Soviet empire sent their rabbis, scribes, and elders to the great Jewish council in Moscow. There they affirmed their absolute loyalty to the cause of Bolshevism. Their high priests urged Jews in occupied areas to act contrary to international law, to become saboteurs, terrorists, and snipers. The spirits of Soviet generals must be very low if Jewish leaders say openly what they formerly taught only secretly in the Talmud, if high priests of World Jewry encourage base crimes of every sort, if they claim acts of despicable criminality to be holy! We already knew from German military reports of captured equipment and sunken ships that Soviet forces would soon be short of planes and tanks. How great the shortage must be, however, if Moscow calls on Jews throughout the world to speed up the supply of these important weapons! The call for active Jewish soldiers will, of course, remain wishful thinking. The Jewish soldier who will courageously risk his life for the cause has yet to be born. For thousands of years the Jewish people limited itself to inciting other peoples to war, viewing wars as the ritual slaughter of gentile humanity.